Sometimes I have a good idea of where I’m going with these Making it Yours looks, and sometimes the design shifts and changes along the way. 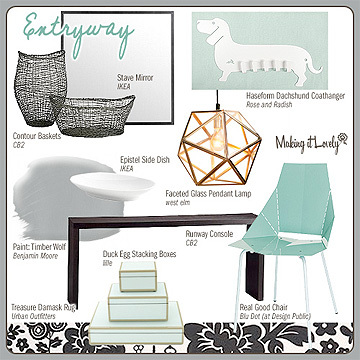 This is the second of three rooms put together around IKEA’s Möckelby table. We saw it paired with some amazing wallpaper last time, so I didn’t want to fall back to another wallpaper design this time. I knew I wanted to bring in that light (isn’t it fantastic? ), but beyond that, I wasn’t sure where things would end up. Chairs were the next piece of the puzzle, and once I remembered the limited edition pink Arne Jacobsen chairs, everything fell into place. Pink and gold! Modern, but with a nod to the past! Neon lights! Yes. 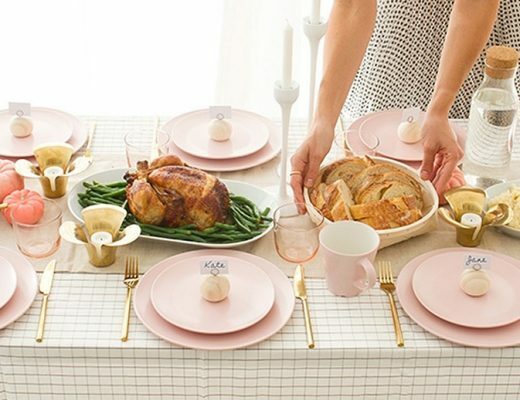 I *must* have that Kate Spade rose gold dinnerware. Must! 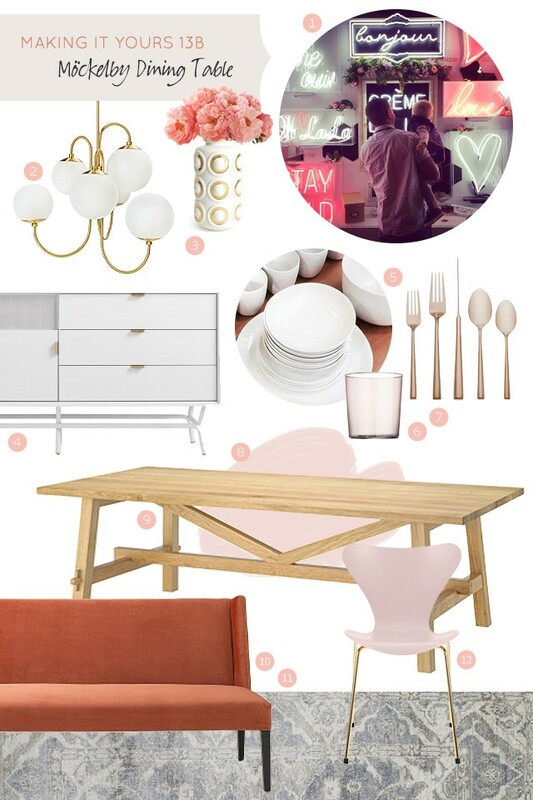 I want to buy everything in this post and just put it in my dining room. Seriously! $843 per chair….a bit over the top. Holy ship that is a lot for a chair! I got the same shaped chairs from RH a couple years ago on clearance for $12 each. They’re white but with a little paint, they would look quite similar to the pricey pink ones! I bet you could find similar style chairs out there for much, much less! Yeah, they’re crazy expensive! It’s an officially licensed chair, so those go for $528. It’s lacquered, which raises the price another $207. And then on top of that, it’s a limited edition anniversary color with 24-karat gold on the legs. You can by a knockoff for $60 in a more bubblegum bright pink with chrome legs, but it’s good to be aware of the originals rather than going straight to knockoffs all the time. It’s out of my budget (and probably most budgets), but somebody may be looking for something special and this could work for them. gorgeous color palette! also, love the neon signs…keeps it from becoming too sweet.